August 4-8, 2014: GLICE, a project supported by WorldLoop, actively involved in e-waste recycling in Burundi, organised the second edition of Information and Communication Technology Forum of Bujumbura (FITB). Although a young initiative, the FITB is increasingly becoming an important “rendez-vous” for all ICT companies. This is a once a year opportunity for ICT organizations to showcase their products, services and innovations. The forum ended with a ceremony where prizes were given to out to (a) the best stands; (b) best products and services; and (c) young entrepreneurs. 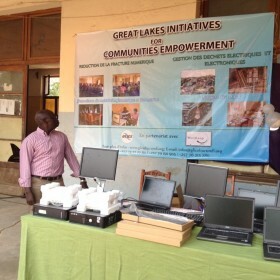 For GLICE, this forum was an important e-waste awareness raising opportunity. Visitors learned the importance of properly recycling electronic waste. For most of them, the concept of recycling e-waste was all new. In addition to protecting our health and environment, the aspect of green jobs creation was equally appreciated.